While preparing for a trip to Greece last summer, I spent as many hours as possible sketching and painting out-of-doors. 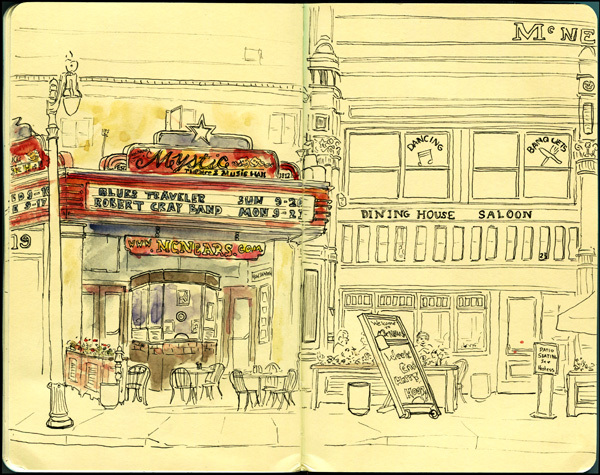 One of those days I was in Petaluma, California drawing the Mystic Theatre, a well known music venue. Built in 1911, the theater originally hosted live Vaudeville entertainment, but today it hosts a plethora of modern music with a focus on rock and blues bands. McNears Irish Pub next door helps keep peopleâ€™s whistles wet before and after the shows next door. The city of Petaluma has an eclectic selection of architecture ranging from brand new to early twentieth century, making it a great destination for drawing. But most often I find myself here for the pizza at Old Chicago. They serve up a mean deep dish pizza piled high with ingredients and oozing with cheese. I find it especially hard to resist after a day of drawing, like today.Â In between the McNears Restaurant and Old Chicago, there is a vacant lot where a scene from the movie American Graffiti (directed by George Lucas) was filmed. August 18, 2010 March 29, 2013 richardComments are off for this post.